National charity Cycling UK has backed walking and cycling campaigners Sustrans in a row over plans to run a new light rail link alongside a walking and cycling route between Bath and Bristol. The Bristol Post reported that the eastern route of the city’s mooted 'underground metro train' could take the form of tram-like light rail system running alongside the cycle path between the two cities, which is which is partly made up of a former rail line. Sustrans, which runs the National Cycle Network, said it was ‘disappointed’ by the report, adding that the former rail line would not be a suitable location for a rapid transit link and that there would be substantial local opposition to any plans. It said the path has become the busiest dedicated traffic-free route for people walking and cycling in the country and is ‘seen by many as a community asset serving as a tourist destination, a place of business and a green corridor of wildlife habitat of significant value’. 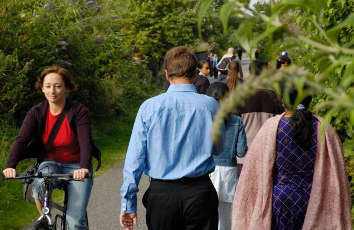 Roger Geffen, policy director at Cycling UK, told Transport Network: 'The Bristol-Bath path enables huge numbers of people to travel to work or to school each day without using cars. It would be bitterly ironic to remove it for the sake of a light rail project aimed at doing the same thing. However, campaign group Rail Future said Sustrans had ‘got it wrong’ and ‘want to block future rail development’. In an open letter to Mr Cleeton, Railfuture’s press officer, Bruce Williamson, said he was himself ‘disappointed that an organisation called Sustrans is trying to scupper new sustainable transport projects’. He also disputed Sustrans’ argument that the route was too narrow to run a rail line alongside the path, pointing out that this has been achieved elsewhere with both rail and bus routes.